It took until my third Easter in China, but I’ve finally celebrated the holiday with some amount of pomp and circumstance. Sadly there were no chocolate eggs, but I did manage to pull together a sampling of some of the Easter food Maggie might experience had we been in Canada. 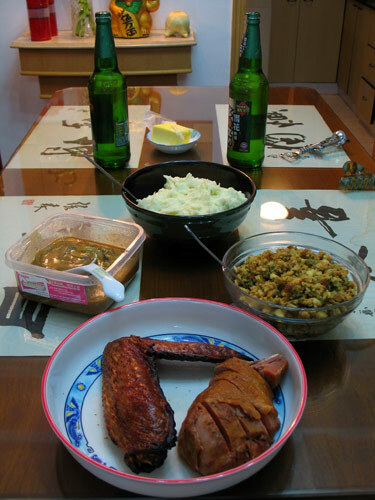 We managed turkey (though it was roasted like duck), stuffing (from a box), mashed potatoes and gravy. The gravy was the hardest part. I searched all day for a recipe that didn’t involve using drippings from something cooked in an oven, nor some hard-to-find easy-additive solution. Eventually I sorted it out and combined a few sets of instructions and came out with something pretty half decent – only to open the box of StoveTop and find a free instant gravy package included. 他妈的! Sometimes I forget how ‘Chinese’ my wife is. After instructing her that she should just spoon a bit of everything onto her plate I turned away just long enough for her to put it all on there and mix it together. When I asked her why she was eating gravy-stuffing-mashed potatoes in one stirred mess, she said she thought that’s what I meant by “all together on the plate”. Sigh. I made a believer out of her however, and I’ll be making mashed potatoes on a semi-frequent basis from now on. 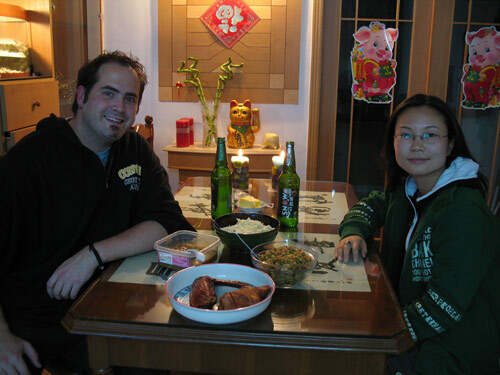 See all China Expat Life, Special Days posts. No problem. It just sounds like she is a Southerner (US) to me. It’s’posed tuh b’lek dat. I love “Happy Resurrection Festival.” Happy Pepsi day to you, too! You’ve an amazing head full of random knowledge man. 🙂 And yeah, I’ll have to check to see if here father’s people were really from Shandong and not Savannah.